A cocktail's name -- and its identity -- comes from its ingredients. A white Russian gets its name not only from its appearance but also from the vodka in the drink. Although a white Russian will not technically be a white Russian without vodka, the cocktail does have a few simple and tasty variations for when vodka is nowhere to be found. White Russians are relatively simple mixed drinks with three main ingredients: vodka, coffee liqueur and a dairy type -- usually cream, milk or half-and-half. 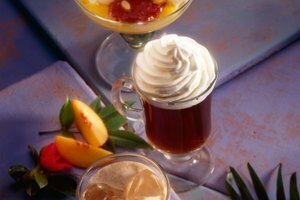 The coffee liqueur and cream blend together for a subtle yet sugary latte or coffee ice cream taste, while the vodka, with its near invisible odor and taste, quietly blends into the background, adding potency to the drink without affecting its flavors. An easy white Russian is equal parts vodka, coffee liqueur and half-and-half on the rocks. A white Russian without vodka has two different names, the brown cow or the dirty cow. 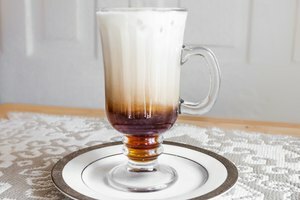 One version of the drink is to pour equal parts coffee liqueur and cream on the rocks; adding a few dashes of chocolate syrup makes the drink a brown cow from hell. 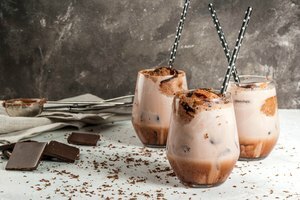 Another version is a bit fancier -- fill a champagne flute with ice, fill it halfway with coffee liqueur, top it with milk, cream or half-and-half, then garnish with a sprinkle of nutmeg on top. Substituting another major spirit for vodka produces a number of other white Russian variations -- some tasting more like a white Russian than others. The closest drink variation is the white Cuban, which is rum subbing for the vodka; the rum's sweetness makes the drink a little more sugary but it will not overpower the other flavors. Other drink variations include: the white albino, made with Puerto Rican rum, which is a darker, more fiery rum, and the white trash, made with whiskey. Add or substitute other ingredients for a wide range of cocktails still having a white Russian feel. Substitute the vodka with vanilla-flavored vodka and top the drink with a splash of cola or root beer for a Colorado bulldog; also substitute the coffee liqueur with creme de menthe for a Dublin bulldog. 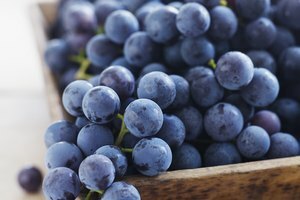 If you desire a little more fruit in your drink, substitute the coffee liqueur with cherry brandy for a pink Russian. The dairy in a white Russian may also be substituted -- pouring an Irish stout instead of dairy transforms the drink into a stout Russian.